Director Jewels: Tiny Prints Holiday Cards + $50 Credit Giveaway! 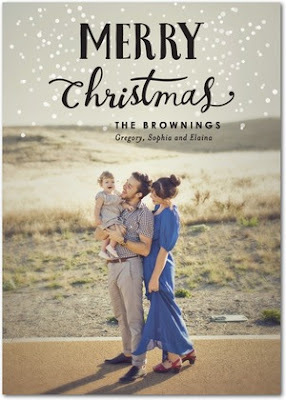 The first Christmas that Andrew and I were married, I set some really high expectations for myself. I handmade all of our Christmas cards. We're talking like, 200 cards. It was fun, they were really pretty... and I had no idea that it would probably never happen again. Since that time, I have come to the realization that it is insane trying to get everything done during the busy holiday season! Christmas cards are a tradition that I really don't want to give up, but I have to face the facts that I simply cannot spend weeks on end creating cards by hand. I'm pretty sure Lincoln would rip/eat them all if I even tried. So what is my solution, you ask? This year, I am ordering my Christmas Cards online from Tiny Prints! Their collection of cards this year features over 800 designs, so there is definitely something to suit every family's needs! I have so many favorites, I'm having a hard time choosing. I won't actually be ordering my cards until sometime in early December, since we will have a new family member arriving sometime in the next few weeks! That gives me a little time to decide, but I need help! 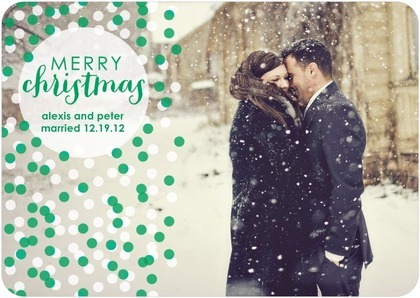 I know our color scheme in our Christmas photo will be black/green/white, which definitely influenced my choices. Which of these cards do you like best? So what do you think? Do I have a winner? I love all of them! 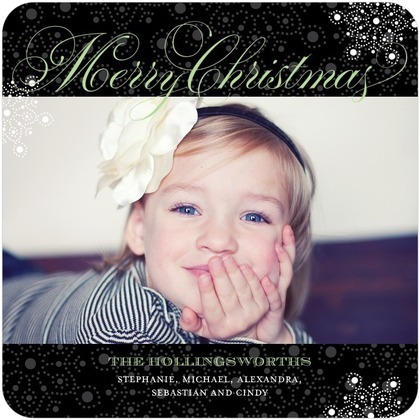 Make sure you check out Tiny Prints' Special Offers to snag a great deal on your own holiday cards. You can also follow them via social media such as Facebook, Twitter, Pinterest, or Google+! One Director Jewels reader will win a credit for $50 off your total Tiny Prints order! This prize does not include shipping, cannot be combined with any other promos, and expires 12-14-2012. This giveaway will end on November 16 at 11:01pm CST. This giveaway is open to US readers only. Thank you to Tiny Prints for sponsoring my card samples and the giveaway prize! I received no other compensation and all views expressed are my own. For more information, you can read my Giveaway Policy and my Disclosure Policy. I like option B or C. The only thing with B is that all of the dots might be too distracting. I guess it depends upon how you take the picture. I really like option D. I am a fan of the rounded corners but agree with the other comment that the dots on option B could be distracting. As for which card I want. I like the Taste of Tradition card. I love the Happliy Wrapped ornament card! I really like A Merry Spot! Oh, geez! All of Tiny Prints Cards are awesome but I love option B.
I visited the site and I honestly couldn't choose! Option a or c are so nice! I think I would pick the taste of tradition. I like them all. I think I like D. Thanks! I like Snowy Air a lot! I would choose the "be shiny" card for our Christmas cards! Option c is my favorite. I love all of the tiny prints cards that are in non traditional shapes. I like option A the best. I love C! Simple but beautiful and perfect for the holidays! I like the Be Bright - so fun! I love the wish wraparound!!! I like Option A the best. Not only do I like the design the best but I think it's the one that would end up looking the best with real photos. Have fun! 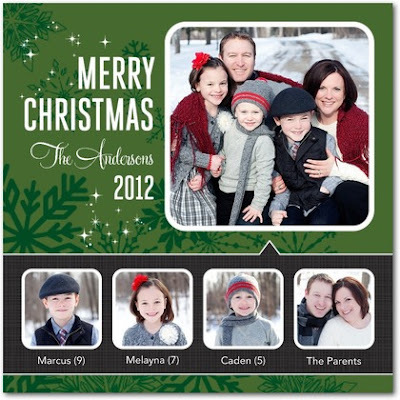 For my family card, I think I'll choose Happy Highlights. So cute! I would get the merriest stripes! Option C! It's so hip and modern! Option A - everybody wants a close-up of the new arrival. Tough one, but I like the first card since it shows everyone. Handwritten love is my favorite. I love option c! So modern and adorable. Born This Day is my favorite card. Option B is my favorite for you. For my family I like Chic Colors! Love option B... thats the one I want! Option C is my favorite!